The Minster for Equality, Samantha Sacramento is attending high-level technical meetings on the Gender Pay Gap in Iceland. A European Parliament vote calling for a "solution" to the sovereignty of Gibraltar undermines the EU's position as a defender of democracy, self-determination and human rights. 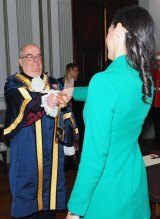 Investiture of Mr John Goncalves as Mayor of the City of Gibraltar took place yesterday at the mayor's parlour. Remainers across the UK fear that any new free-trade agreements struck with Commonwealth nations would not soften the economic blow of a no deal Brexit. Azopardi says: What relationship do we want with the EU?